The purpose of this study is to examine diurnal variation in several thermal and metabolic parameters of the golden hamster, Mesocricetus auratus. Metabolic rate, core temperature, and evaporative water loss were measured during night and day at several ambient temperatures. Wet minimal thermal conductance, dry minimal thermal conductance, basal metabolic rate, minimal net heat production and the lower critical temperature difference were estimated from these measurements. Wet and dry minimal thermal conductance, evaporative water loss, core temperature, basal metabolic rate, and lower critical temperature difference were greater during the active phase than during the resting phase. The diurnal variation in wet minimal thermal conductance was much smaller than that predicted from published allometric equations. The diurnal variation in wet minimal thermal conductance was 9% of the 24-h mean. The diurnal variation in dry minimal thermal conductance was 26% of the 24-h mean. The higher active-phase core temperature and basal metabolic rate may function to enhance peak metabolic performance during the active phase. The lower resting phase metabolism and core temperature may reduce energetic costs. 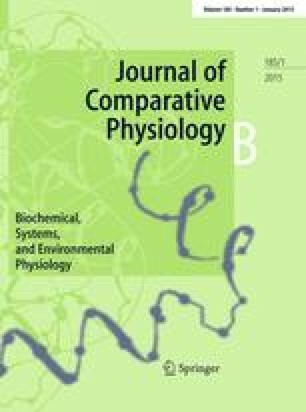 The greater active-phase lower critical temperature difference may be a result of the greater active-phase basal metabolic rate. Diurnal variation in minimal thermal conductance may be caused by changes in peripheral circulation.